Lab-grown diamonds are real diamonds! Chemically, physically and optically identical to mined diamonds. EverettBrookes Jewellers not only boast decades of experience in natural diamonds but are now one of Australia’s largest retailers of lab-grown diamonds. Lab-grown diamonds are 100% just as pure as mined diamonds, so much so, that it’s difficult to really tell the difference between both without expensive equipment. Our diamonds are certified, with a guarantee of purity. The diamond-mining process is an extremely energy-intensive and ecologically invasive procedure. That’s why the man-made process of growing diamonds in labs is so eco-friendly. While the diamonds that are mined normally take centuries to develop fully, lab-grown diamonds can be grown in a few weeks. 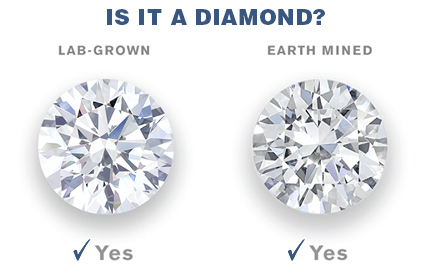 Why Choose Lab Grown Diamonds? As they’re grown in a controlled environment, the processes used for lab-created diamonds are extremely safe and pose no threat to the people working on them. As a result, these diamonds are also blood-free diamonds. Lab-grown diamonds are up to 50% cheaper than mined ones, with absolutely no difference in quality and purity. Just imagine a bright, sparkling diamond at practically half the cost! When you’re looking for the perfect diamond for your budget, consider lab-grown diamonds. To the naked eye, there is no difference between a mined and a created diamond. As the mined diamonds and created diamonds are very difficult to differentiate, complete disclosure is clearly in the best interests of the consumer. So that the customer may be well informed about their choices, our industry is bound by law and ethics to clearly disclose that our diamonds are lab-grown or created.